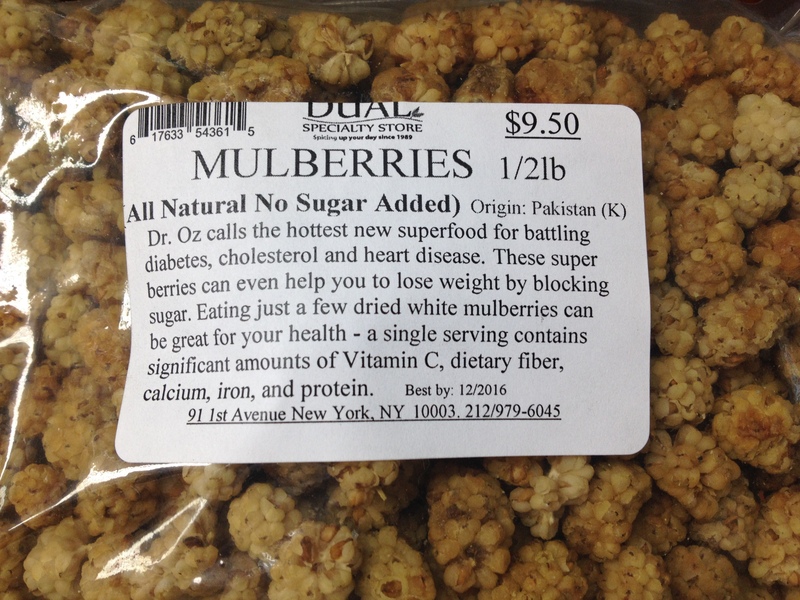 I saw these white Mulberries the other day at one of my favorite food stores: Dual Specialty store in the East Village. Oh Dr. Oz, really? It just seems too preposterous to me that you would need to write such crap on a bag of dried white Mulberries. It also made me smile that after product of Pakistan there is a (K) which I assume means they are Kosher white Mulberries, because you know, you have to watch out for those non Kosher white Mulberries. For those of you not so aware of kosher food rules all fruit and vegetables are kosher. What it mostly points out is that these are an export item. Why does a humble item like dried fruit require such a hard sell? With such bogus claims on it? And please help me out here, what exactly does blocking sugar mean? Don’t come any closer sugar I have you blocked! White Mulberry is often tried in order to help: diabetes, treating high cholesterol levels, high blood pressure, the common cold and its symptoms, muscle and joint pain such as from arthritis, constipation, dizziness, ringing in the ears, hair loss, and premature graying. Don’t get me wrong I think that Chinese medicine has a lot of offer, I just think this kind of sales pitch on an ingredient is unnecessary. I have to admit my response to this, and why I felt the need to write about it today, is that I actually found myself getting sucked into the sales pitch. More, maybe I should try this than Oh it will cure what ever ails me, but still it just shows you how insidious this kind of marketing can be. Anyone out there had any experience with this hottest new super food – white Mulberries? This entry was posted in NYC, Other Stuff and tagged Dr Oz, Dual Specialty Store, east village, NYC, White Mulberries. Bookmark the permalink.